What questions do I need answered before buying a pool? So you are preparing for your appointment with you first pool company and you need some conversation starters. You’ve made a copy of your plot plan for the visit showing your lot, house and easements. You just have to get answers to all your questions. Here is a list of some key pool buying questions so you will look like a pro and get the information you need. What size is best for us? Diving or non diving? What about benches and ledges and what do they cost? What are the pro and cons of fiberglass, vinyl liner and concrete pools? What is included in your basic pool package? What kind of heaters do you sell? Discuss gas v electric. What is the pool season in Indiana without a heater, with a gas heater or with a heat pump? What are the different options in auto covers, especially track options? me that your concrete guy is really good. Can I use my own guy? How long will my equipment last and what are the warranties? How can I check out your reputation? Do you have a reference list? Do you have liability insurance? If requested, would you provide me a copy of your certificate? What do you do about after sale service? What services do you provide? What do you charge? Why is there sometimes a wide margin in price among builders? How long does the process take? What will my yard look like during and after? What about the access for construction? Sidewalk or driveway issues? Will my homeowners insurance or real estate taxes increase in price? When could you start? How long will it take? What kind of drawing do you do? Do you ever use a landscape architect for drawings? What will be the effect of “freeze-thaw” on my pool and pool deck? What about drainage? Who reroutes downspouts and sump lines? Is there a way to get water out from under my pool? Do you have any landscapers/fence companies that you use in my area? Do you use subcontractors? For what? Do you give any kind of training on how to take care of the pool? What about payments and draws? When are they due and how much are they? What costs will I incur that are not in your quote? What are the allowance items in the quote and will they be sufficient? WHEW! That would be a good start! 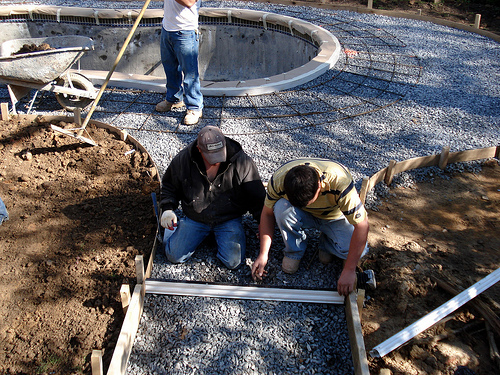 Site References: Check out Perma's fiberglass pools and vinyl liner pools and pool options. Then check out our key Let's Get Started Blogs!